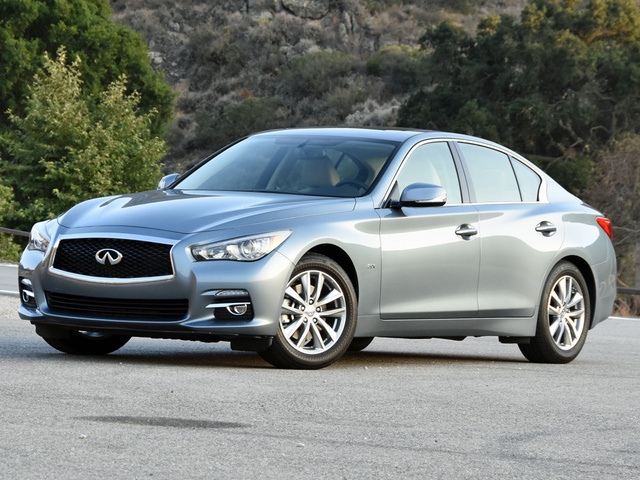 CarGurus has 10,280 nationwide Q50 listings starting at $11,995. If you’re seeking maximum driving enjoyment, you’ll want to upgrade from the 2016 Infiniti Q50 2.0t to the 3.0t, the Sport, or the Red Sport 400. Improved for 2016, the Infiniti Q50 can be taken more seriously as a legitimate luxury sports sedan. Attractive, comfortable, and technologically sophisticated, this is a stylish alternative to the status quo. But what compels someone to want an Infiniti Q50? After a week-long test, the answer to that question remains murky. “Why does someone get an Infiniti?” I asked a friend and colleague who also reviews cars for a living and serves as a respected auto-industry analyst. He had just returned from the media introduction for the little Infiniti QX30 crossover, and I had just turned in the keys to a 2016 Infiniti Q50 2.0t. Over the course of lunch, we had trouble identifying why someone might want an Infiniti over a competing product. Established in 1990 as the luxury channel for Nissan, Infiniti has inconsistently staked its claim as Japan’s performance brand, even though it has been Acura and Lexus that have produced genuine sports cars in the NSX and LFA. 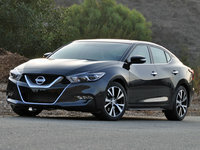 Historical forays into tacky chrome grilles and soft suspensions to expand the brand’s appeal with traditionalists have occasionally diluted Infiniti’s identity, rebadged Nissan models regularly pepper the product lineup, and most recently it has taken a decade for loyalists to get a new Q60, the closest thing to a sports car that the company sells. There is no flagship for the brand, either, unless you count the enormous QX80 SUV. Infiniti is almost criminally underfunded in terms of product. Infinitis are good looking, my friend and I agreed. Most of them are enjoyable to drive, we concurred. But is that enough to woo buyers seeking peer validation through the purchase of a luxury vehicle or driving enthusiasts seeking a credible tool for carving canyons? We decided that it was not, leaving the choice of an Infiniti to style preference and the lease deal, especially in light of the brand’s middling performance in the most recent J.D. Power U.S. Customer Service Index Study and recently unfavorable ratings from Consumer Reports. We also recognized that Infiniti has built itself a loyal fan base around the G35, which became the G37, which became the Q40/Q60 and was sold alongside the G37’s replacement, the Q50. (No, that’s not confusing at all.) 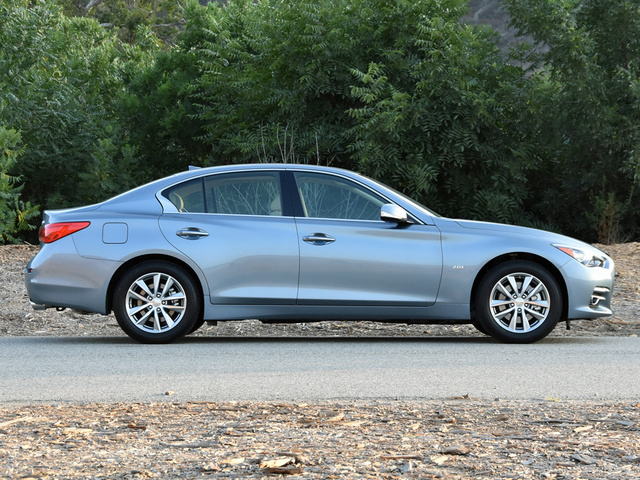 There is good reason for the love lavished upon the FM-platform G models, and many of the characteristics that made the G a serious contender and an alternative to the status quo translated to the Q50 when it debuted amid (and was overshadowed by) Infiniti’s complete overhaul of its naming conventions. 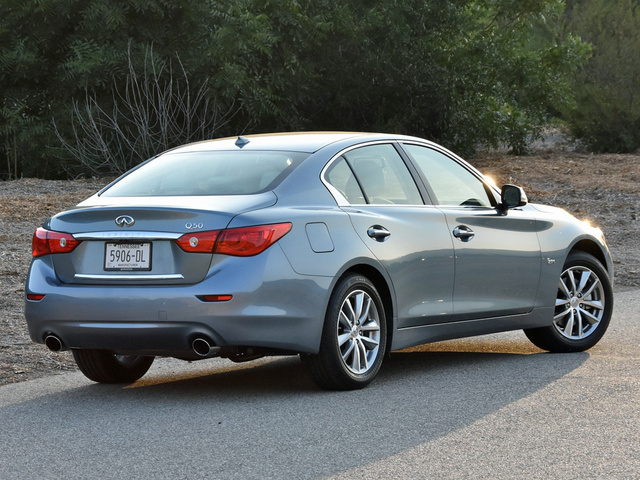 Still, Infiniti stumbled with the Q50, diluting its driving character if not its design. For 2016, the company aims to right some of the wrongs, rolling out a new powertrain lineup, retuning the car’s driving dynamics, upgrading the car’s technology, and introducing a new Red Sport 400 performance model. The Q50 model range now spans from the 2.0t at $34,855, to the Red Sport 400 at $50,855. In between are 3.0t, Sport, and Hybrid variants, and all-wheel drive is optional for every single version of the 2016 Q50. For this review, I wanted to examine the lease special, the version of the Q50 that entices customers to showrooms with the promise of a luxurious sports sedan at an attractive monthly payment. My Q50 2.0t Premium had rear-wheel drive (RWD), an optional Premium Plus package containing a voice-recognition navigation system and several other conveniences, and a sticker price of $40,705, including the $905 destination charge. Painted Hagane Blue and equipped with Stone leatherette seating, my Q50 2.0t was rakishly handsome, combining a fair degree of visual drama with signature Infiniti design elements. You won’t mistake the appealing Q50 for anything but an Infiniti, but the standard 17-inch aluminum wheels are rather plain and look too small tucked into the car’s swollen fenders. Infiniti ought to offer a standalone 19-inch wheel upgrade package for the 2.0t model. Inside, occupants face a driver-centric, dual-cockpit dashboard. The Q50’s materials and textures convey quality and give the car an upscale appearance, and the leatherette convincingly mimics real leather. Especially impressive is how Infiniti pulls off the Stone-colored interior, which exudes warmth in a way that gray interiors usually do not. However, the light-colored carpets are sure to get trashed in no time, especially when the car is used in foul-weather climates. Like every other car company, Infiniti faces looming fines if it doesn’t improve fuel economy across its fleet of cars and SUVs. Thus, the 2016 Q50 2.0t is equipped with a turbocharged 2.0-liter 4-cylinder engine, one sourced from Mercedes-Benz but built in Tennessee. This is not the same engine that Mercedes uses in the C300. This is an older and less powerful motor, one making 208 horsepower at 5,500 rpm and 258 lb-ft of torque between 1,500 and 3,500 rpm. It is used in the Mercedes CLA-Class and GLA-Class models, as well as the new Infiniti QX30. 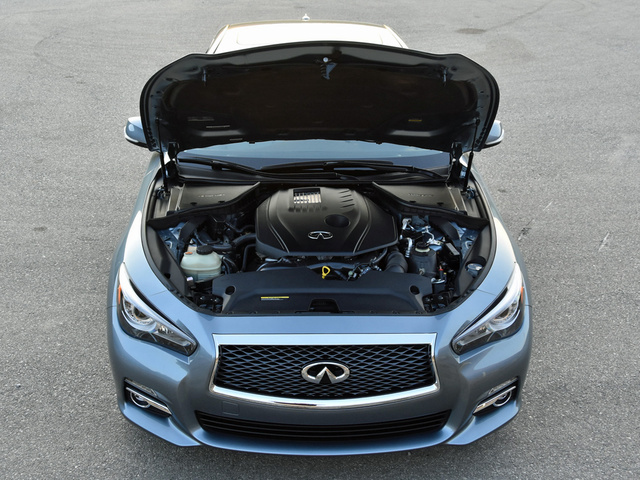 In the Q50 2.0t, this engine is paired with an Infiniti-sourced 7-speed automatic transmission with downshift rev matching and adaptive shift control. Standard, Sport, Snow, and Personal driving modes are available, but paddle shifters are absent. The car does have idle stop technology that shuts the engine off when you’re sitting motionless in traffic or at an intersection in order to conserve fuel. This system seems to achieve this goal, as I averaged 26.3 mpg on my test loop, coming in slightly higher than the EPA’s official rating of 26 mpg in combined driving. Neither as refined nor as thrilling as the turbocharged 2.0-liter 4-cylinder engine that Audi employs in its redesigned 2017 A4, and lacking the horsepower, torque, and broad spread of power exhibited by the turbocharged 2.0-liter used in the Mercedes-Benz C300 sedan, the Q50 2.0t’s engine comes across as second-rate. Direct fuel injection gives it an unbecoming clatter, and the idle-stop technology operates comparatively harshly, allowing the Q50 to shudder as it shuts the engine off and then re-starts it. Acceleration is decent, but the Q50 2.0t lacks zing. In other words, it doesn’t feel anywhere near as energetic as the turbocharged 4-cylinder engines in some competitors. Infiniti’s 7-speed automatic transmission is a model of perfection, though, delivering smooth, seamless shifts under normal driving conditions and quick, crisp gear changes when driving the car with vigor. While the Q50 2.0t is begging for a set of paddle shifters, the good news is that the manual shift gate is intuitively mapped, making it effortless to use while eliminating a potential source of driving distraction. Braking is excellent, and the Q50’s revised suspension tuning and standard Active Trace Control make the car genuinely enjoyable to fling down a country road. In addition to providing adept handling, the suspension delivers an impressive ride quality. Over imperfect pavement, though, lots of road noise enters the cabin, a long-standing Infiniti bug-a-boo. Speed-sensing hydraulic electric steering is reasonably quick to respond to input, but it doesn’t convey much in the way of feel, displaying omnipresent artificiality. At low speeds, it is too heavy. At higher speeds, it feels numb and disconnected on-center. Perhaps more than anything else, it is the steering that dulls the Q50’s driving dynamics. Most likely, if you’re seeking maximum driving enjoyment, you’ll want to upgrade to the Q50 3.0t, Sport, or Red Sport 400. If you don’t care about such things, you’ll probably find the Q50 2.0t satisfying if not enthralling to drive. 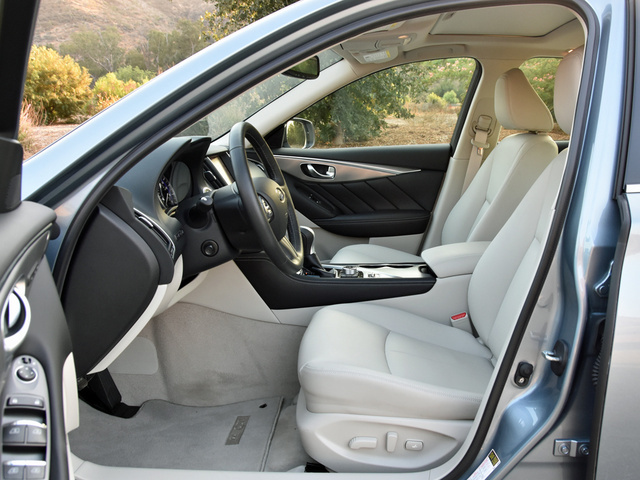 To get leather upholstery in a Q50 2.0t, you must first upgrade to Premium trim, and then you must install the Premium Plus and Driver Assistance option packages, at which point you can fork over another grand for the real leather, bringing the car’s price to more than $44,000. When the Audi dealership next door is offering an A4 with standard leather, this seems like an unfavorable value proposition. In all other respects, and in spite of what appears to be shared switchgear with some Nissan models, the Q50 exudes quality. Clear, simple markings make controls easy to find and use, and while I’d like to have a stereo tuning knob instead of a rocker switch, Infiniti does a good job of separating the stereo and climate controls from navigation and secondary infotainment functions. Front seating is comfortable, but ventilation would be nice at this price point, especially with the sweat-trapping leatherette upholstery. Both front seats supply a wide range of adjustment, and in classic G tradition the driver enjoys a rather low-slung and intimate relationship with the steering wheel, dashboard, and windshield. You sit forward in this car, fostering a feeling of immediacy with the road and environment that heightens the sensation of driving. 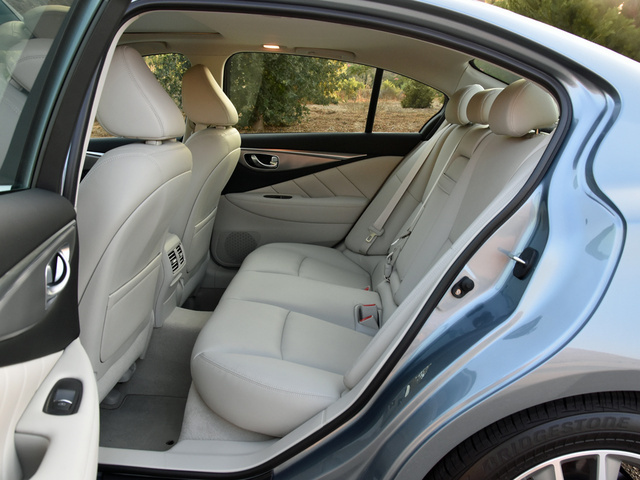 Rear seat passengers will be comfortable, too, especially if they prefer a more reclined position. Thigh support is excellent, but I found the rear seatback angle to promote slouching, and over time that’s tiresome. Legroom and foot space are adequate rather than generous. Cargo space is unexpectedly tight at 13.2 cubic feet. The trunk is oddly shaped, too, and does not offer hands-free functionality. Apparently, unlike many people, I have no problem with the design of Infiniti’s dual-screen infotainment system, which is paired with a 14-speaker Bose premium audio system in Premium models. Clear separation between the navigation map, main stereo, and primary climate controls makes basic reference and use of the system easy. The graphics are modern and pleasing to the eye. The navigation map is always displayed, except when the reversing camera uses the top screen. Things do get a little more complicated when sorting through the multi-screen menu of InTouch Apps, but this is true of most infotainment systems. Criticism is deserved for the system’s lack of smartphone projection technology in the form of Apple CarPlay and Android Auto. Also, when trying to find directions to the nearest Chipotle restaurant, Infiniti’s voice-recognition technology had trouble understanding me while Siri did not. Unfortunately, when my iPhone 6 was connected via the USB port, Siri did not issue directions through the car’s speakers, adding to my aggravation. InTouch Services is a subscription-based technology providing automatic collision notification, emergency calling capability, remote access to certain vehicle functions, safe teen driver settings, and more. Access is free for the first year of ownership. After that, this is an extra-cost item. My test car did not have the optional Driver Assistance package, which includes a long list of safety-related technologies. It includes predictive forward-collision warning with automatic emergency braking, which can “see” two vehicles ahead to determine whether traffic is suddenly braking, giving the Q50 extra time to react to a collision threat. Also, rear automatic emergency braking, moving-object detection, and blind-spot monitoring with rear cross-traffic alert are a part of this package. For additional driver-assistance features, you’ll need to upgrade to the 3.0t, the Hybrid, the Sport, or the Red Sport 400. These are available with a blind-spot intervention system, lane-departure warning with lane-departure prevention, active lane control, adaptive headlights, and pre-crash seat belts. As far as crash protection is concerned, neither the NHTSA nor the IIHS has carried forward the Q50’s frontal-impact test ratings for 2016, indicating that Infiniti has made some structural changes designed to improve results. While the results of any changes remain to be determined, rest assured that when a Q50 is fully equipped with all of its available driver-assistance systems, it will do everything it can to avoid a collision in the first place. According to Infiniti, you can lease the Q50 2.0t Premium for $279 per month for 39 months after making a down payment of $3,999. Another way to think of that is $381.54 per month with no money down. 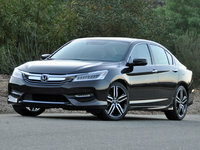 Of course, you’re getting only 10,000 miles of travel per year with this lease, and the Premium model doesn’t include leather seats, navigation, or any of the safety-related driver-assistance systems as standard equipment, so you’re looking at an unknown amount of extra cost that likely pushes a lease payment closer to $500 per month. Now, consider that as this review is published you could finance a 2016 Nissan Altima 3.5 SL sedan loaded with every factory-installed upgrade for 72 months using a no-interest loan. The payment would be just over $500 per month, not including tax—and you would own the car when the 33 extra payments conclude. With the leased Infiniti, you’d need to go out and get a different set of wheels. 1.) They are business owners taking advantage of a tax deduction for a company car. 2.) They want the superior customer service that typically accompanies luxury-brand vehicles. 3.) They want to convey a certain level of success or wealth. 4.) They want a robustly engineered and dynamically superior automobile. 5.) They want the latest and greatest technologies in their new vehicle. In this context, the Infiniti Q50 still struggles. This car looks good, the lease payment is appealing within the entry-luxury segment, and the Q50 is available with a long list of driving-assistance technologies. Still, and especially in 2.0t Premium trim, it amounts to nothing more than another nice car in a segment loaded with them. 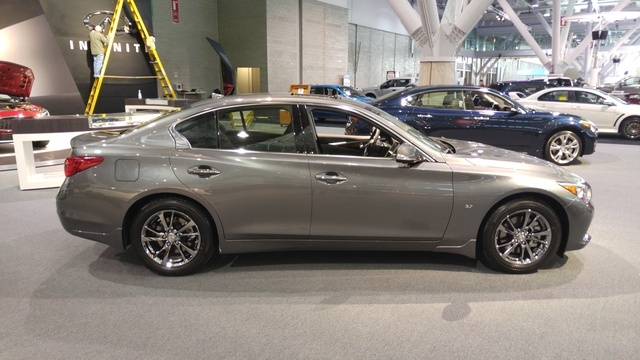 What's your take on the 2016 INFINITI Q50? Have you driven a 2016 INFINITI Q50?